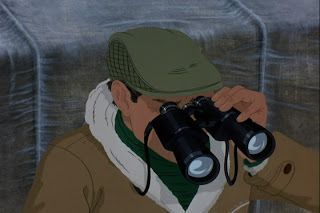 One of my complaints about western animation, particularly those films perpetrated by Disney, is that they are too complacent in targeting an undemanding child audience. Many of the attempts to widen the market have added adult themes, but still without showing any signs of maturity. 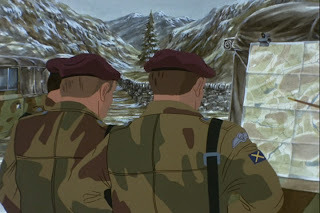 Lack of imagination and poor writing remain common problems despite the freedom of the art form, but my outlook on animation has remained curious and hopeful. A while back I was happy to rediscover French maverick Rene Laloux. Recently I was pleasantly surprised by Britain’s “The Plague Dogs” (1982). 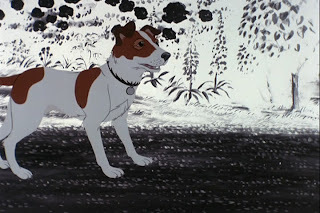 “The Plague Dogs” features the adventures of Rowf, a black lab mix, and Snitter, a fox terrier, after they break out of a Northern England animal research station. Talking animals on the run from mean scientists is nothing new. In fact, if this was handled in typical fashion, it should be old enough to turn me away right there. 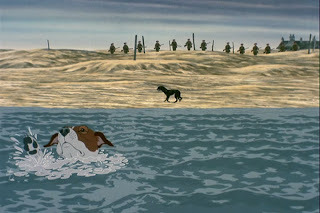 Yet author Richard Adams and director Martin Rosen (both of Watership Down fame) set out to do more than sell popcorn and plushies with a cheesy adventure starring cute anthropomorphized pets. 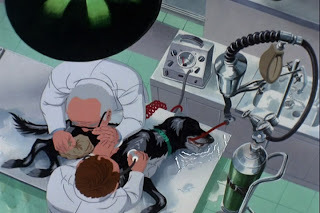 Such ambitions are evident from the opening scenes, set inside a classified military research lab running senselessly cruel tests on animals towards mysterious ends. The facility is a disturbing den of bare cages and menacing equipment capped off by an ominous incinerator that may be the most humane way the test subjects can die. I’m guessing many parents with small children will flip the TV off at about this point. 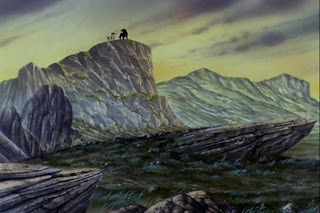 There is a mist of doom enclosing the animals from their first taste of freedom and little doubt of their chances against the wilderness of nature and viciousness of man. Rosen often depicts them as little more than tiny blips against the countryside, simultaneously taking in the grandeur of the rocky gorges and grassy hillsides while emphasizing a sense of helplessness, exposure and danger. 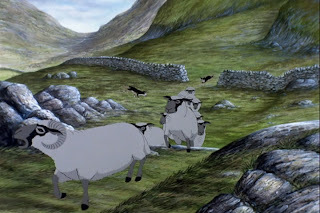 Like many of the great early Disney animations, the attention to detail in the backdrops provides the aura of realism and regional specificity, to say nothing of the beauty. Rosen moves over these images with a camera that pans and tilts with relaxed reverence. He reserves canted shots for the laboratory interior to show the way it twists nature and brings life out of balance. 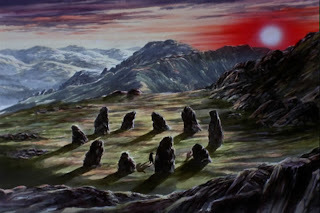 On a few occasions his winding camera movements help put us on the meandering paths that trickle down the moors, though such unusual maneuvers must have made it hard to get the perspective and proportions right. 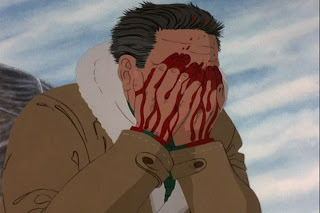 The relatively few character designs do occasionally experience visual glitches, but these faults are smoothed over by the above-average integration of dynamic characters with static backgrounds. The footprints and impressions left in the snow are particularly notable. Another coup for Rosen’s team is the animal movement, which really makes the characters come alive. They behave more accurately than almost any animal animation I’ve seen, from their rhythmic strides and subtle panting to their curious sniffing and twitchy shifts in attention. This awareness of animal mannerisms is matched by a welcome attempt at capturing canine psychology. 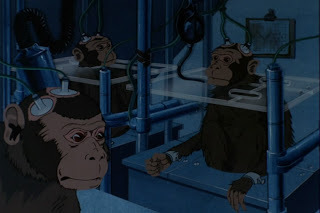 Though their speech is translated into understandable English and characterized by unusual intelligence – they are lab animals, in Adams defense – much of their reasoning is realistically primitive. Their reactions to sheepdogs, cars, helicopters, snow, etc. is tainted by inexperience, guilt, paranoia and solipsism. 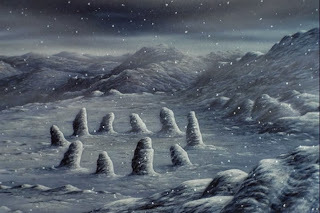 For instance, they assume snow was devised by humans as a way of tracking their movements. Their psychology is troubled by the dysfunctional scars left by the lab. 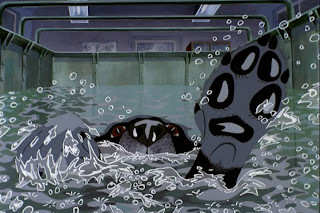 Rowf, a victim of swimming endurance studies, has a fear of water and a distrust for humans that colors his personality, making him grouchy, paranoid and fatalistic. Snitter is more optimistic, having once lived an idealistic life with a human owner. 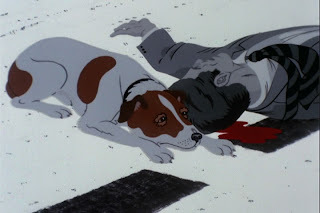 However, his master’s death in a traumatic car accident and lab experiments on his brain have left him prone to fits, dementia and hallucination. He experiences waking dreams and sometimes cannot distinguish the past from the present. The focus is firmly on the animals, with enough time dedicated to them to really develop their characters and test their reactions. The humans are treated quite unconventionally, largely left as a peripheral menace no more resistible or even fathomable to the dogs than nature or fate. 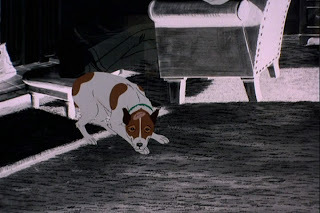 Rosen keeps their faces covered or out of frame in shots where their presence is necessary; portraying them with a dog’s-eye view with little for the audience to relate. 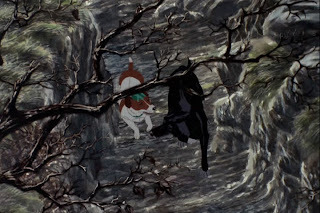 To keep the action understandable, an unusual narration of dialogue snippets is used, with the voices of people miles away playing over the dog-centered adventure. It’s a solution with an eerie overtone, reminiscent of detached gods plotting the downfall of unsuspecting mortals. Though Adams and Rosen cover issues such as animal cruelty, dubious defense research and sensational press coverage, they don’t harp on the social implications beyond the needs of the story. The focus is quite personal, with central concerns on freedom, exploration, survival, mental illness, cooperation and hope. Yet Rowf and Snitter’s adventure has definite allegorical interpretations for those who choose to see them. For instance, one could imagine them as the marginalized victims of homelessness, poverty, under-education and disease who are treated as a nuisance and even persecuted as an indeterminate threat. 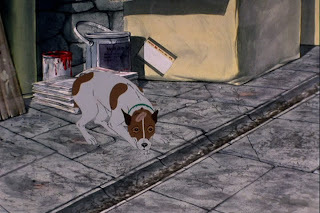 What makes “The Plague Dogs” especially unusual is that, despite the honest care and sympathy the creators have for their protagonists, there is a refusal to compromise. 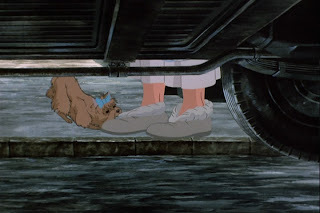 Unlike most animated features a happy ending is not taken for granted; hope is not necessarily well-placed. Grim reality must be faced, whether it’s the savagery of a sheep torn to shreds or the quiet misery of malnourished skin growing taunt across ribs. 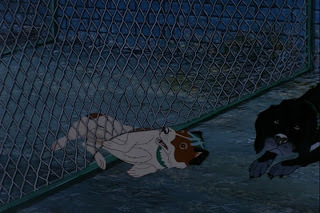 One scene cut from all but the Australian release makes it clear that the dogs will eat human flesh to survive. The pessimistic ending has been the source of much controversy. Cornered at a beach by the military, the dogs swim out to sea where they survive longer than expected due to their endurance training. 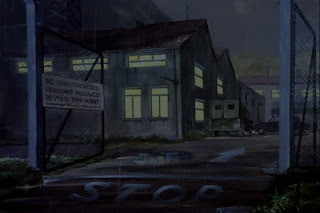 In the book, Adams pulls an unlikely deus ex machine whereby a fishing boat rescues the dogs, Snitter’s former owner turns out not to be dead and a happy reunion caps off the escapade. Rosen takes the braver route, seeing the allegory through to its logical conclusion. 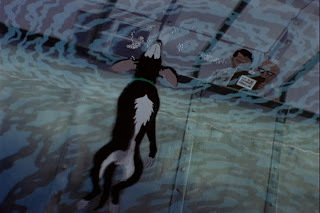 It works as a pessimistic bookending with the film opening shot (see below) of Rowf bursting desperately above the surface of the experiment pool as his strength fades. The spiritual overtones of the final foggy image has a dignity that the animals deserve, though I think the final revival-tent hymn pushes the message a little too far (elsewhere the music is largely a tasteful hodgepodge of synth and Vivaldi). 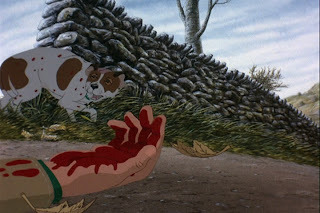 British animators have not been particularly prolific and I’ve been disappointed by my other recent taste, the 1954 “Animal Farm,” so it’s gratifying to see a film as bold and effective as “The Plague Dogs.” It has a character integrity and emotional core that very few animated features achieve (“Grave of the Fireflies” and “Spirited Away” come to mind) and a visual distinctiveness that overcomes modest budgeting and staff. 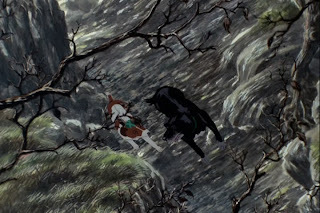 It is well deserving of its cult fandom among grown-ups, both animation buffs and casual viewers. 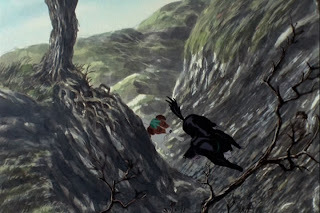 I would like to add Barefoot Gen I & II to that list of animated movies that punch you in the gut emotionally.